Update: ANOTHER boat washed ashore at Cape Arago yesterday (May 20th), making the new number of boats nine TEN. More on this boat soon. In what has been an absolutely peak week and month in tsunami debris, thousands (perhaps more) of pounds of marine debris from the tsunamis, as well as normal debris, has washed ashore on the shores of the eastern Pacific ocean. Strong winds blowing eastward in the California Current System (Washington to Baja) has driven marine debris straight inshore and onto beaches. Perhaps most surprisingly, this has included nine Japanese skiffs that have been cataloged as likely tsunami debris on US beaches. This includes two boats in Washington, one in California, and six in Oregon state alone. Along with these nine boats are likely others that have washed ashore on remote beaches, or have not been reported to authorities. 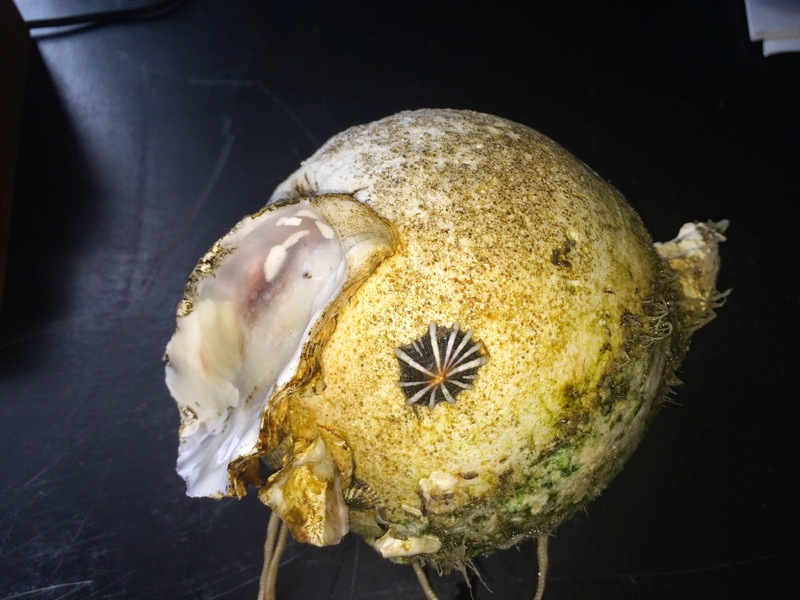 All boats have had live Japanese mussels (Mytilus galloprovincialis), a potential invasive species, as well as hydroids, byrozoans, worms sponges, and even anemones according to Dr. Jim Carlton of Williams-Mystic Maritime Program. Further details on the boats, as well as a map with photos and links to news articles can be found at the bottom of this post. In addition to these boats, large amounts of floating debris have landed on beaches, prompting state and region-wide beach cleanups. One five mile stretch of beach, for example, yielded more than 120 bouys of various sizes- many of which were Japanese or Asian in origin. One of many bouys washed ashore this month. I had a chance to go visit this beach after the cleanup of more than 70 objects, and found at least 50 more still in less accessible areas. My estimate is also very conservative. I was able to photograph many of these objects, but had to turn back due to time constraints. Objects of all sizes littered the beach. 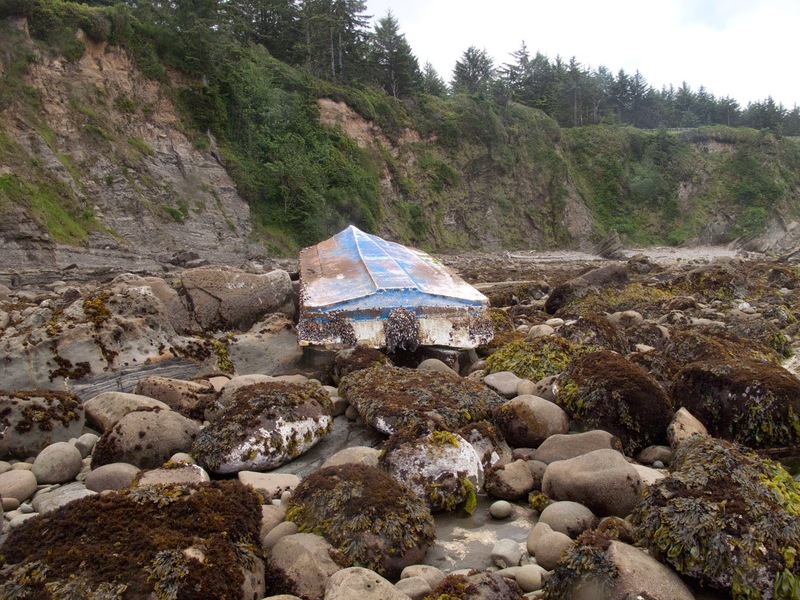 On May 15 and 16, two boats washed ashore in Oregon- a skiff north of the Umpqua River, and a 25-foot skiff in Brian Booth State Park near Newport. This skiff was also accompanied by a large gill net of unknown origin. I was lucky enough to go along and help Dr. John Chapman (Oregon State University) sample this boat before the Parks Department hauled it off before spectators could accumulate. Axes or shovels are used to remove clinging barnacles and other organisms from marine debris for sampling. I am never one to turn down an ax-wielding photo op! The boat was teeming with pelagic gooseneck barnacles (Lepas anatifera) as well as approximately 50 non-native mussels, scallops, and drifter crabs. In the boat was a styrofoam cooler with intact Japanese text that had likely been trapped under the vessel for two years. After the boat was biologically sampled, state employees hauled it off the beach. What else has washed up? Hard hats, plastic debris, ropes, floats, styrofoam, shoes, toys, wood and construction debris, and many other floating objects. Another interesting bit of debris is a bouy with Japanese limpets- to my knowledge this is an uncommon occurrence. Both limpets were alive; the first (shown in the middle of the image below) is Cellana radiata, and the second is as yet confirmed but is likely a Lottia spp. If you find debris on the beach, please report it using the reporting form and remove it from the beach if it is non-hazardous. Remember, do not touch any oil-coated or dangerous objects. Please report any culturally-significant objects (boats, vehicles, religious or personal artifacts), or objects with a lot of marine life. Check my debris resources page for your local authorities. This month has been a reminder that, although the Tohoku earthquake and tsunamis happened over two years ago, we will be seeing marine debris washing ashore for a long time, with unknown ecological impacts. If you would like to get involved and help with beach cleanups or other volunteer work, you can contact SOLVe or the Surfrider Foundation.